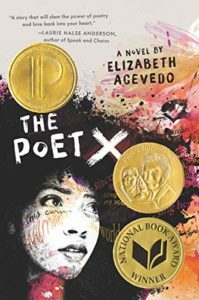 The Poet X is a novel written in verse and the recipient of many prestigious awards including the National Book Award for Young People’s Literature. In this impressive debut work, Elizabeth Acevedo demonstrates with passion and heart both the power and the vital necessity of being heard, especially when you are a young woman of color. And conversely, the novel shows the terrible destructive power of being silenced, ignored and relegated to an object, a mere physical body subject to the rules and punishments of others. which is why I let my knuckles talk for me. Which is why I learned to shrug when my name was replaced by insults. I’ve forced my skin just as thick as I am. Xiomara’s situation at home gets more complicated when she starts 10th grade. One of her favorite classes is English with Ms. Galiano, a tough teacher who seems genuinely interested in what Xiomara writes. When Ms. Galiano encourages Xiomara to join the poetry club, Xiomara wants very much to go but knows she cannot since it meets after school at the same time as confirmation class. Meanwhile, in biology, Xiomara and her lab partner Aman begin a friendship that would infuriate Mami, and so Xiomara begins meeting with him on the sly. They listen to music together in the park and Aman encourages Xiomara’s poetry writing. She is falling in love and feels like someone is really listening to her for the first time, but she knows that she is in a very dangerous situation should Mami ever find out about Aman. Xiomara is not without allies though. Twin, despite his timidity and quiet, does look out for his sister, as does their lifelong pal Caridad. Caridad and Xiomara attend confirmation class together and while Caridad is more of a straight arrow/good girl, she helps cover for Xiomara when she skips class. Both Twin and Caridad recognize Xiomara’s talents as a poet and support her in ways that will surprise and help Xiomara. Xiomara has another unlikely ally, whose identity I won’t reveal but who will play an important role later in the novel when Xiomara and Mami are involved in an explosive situation. It’s difficult to review this novel without spoiling it, and I really don’t want to do that. The story is powerful and beautifully told. Acevedo shows the reader the fear and frustration that drives parents to try to control and dominate their children, the harm that results from stifling children’s questions, the objectification of young women’s bodies and the blame placed on them for that, and the power one feels when she is free to speak as well as the confidence and esteem that result from being heard. I think young girls will recognize Xiomara’s plight and perhaps young men will have their eyes opened as to how a friend and ally ought to behave. Share the post "Now Hear This"
I read this book in print and listened to the audiobook because I wanted to experience Acevedo’s National Slam Champion delivery of the poems. THE POET X captivated me. In fact, the story’s climax was a great example of this plot element in action: I was on edge. Captivating, relevant, and poignant. This book is one of my more memorable and favorite reads in recent months.